H.E. 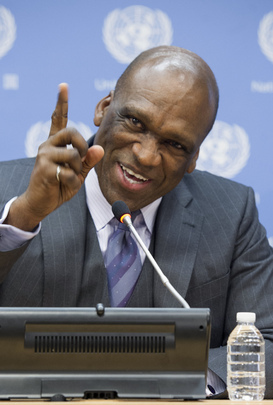 Mr. John W. Ashe was elected President of the United Nations General Assembly’s 68th session on 14 June 2013. At the time of his election, he was serving as Permanent Representative of Antigua and Barbuda to the United Nations. H.E. Mr. John W. Ashe presided the General Assembly’s 68th session from 17 September 2013 to 15 September 2014. The Post-2015 Development Agenda: Setting the Stage! During the 68th session of the United Nations General Assembly, the President, H.E. Dr. John W. Ashe, and his team worked to promote greater engagement with Member States and all relevant stakeholders as we set the stage for defining the Post-2015 Development Agenda. In this regard, Member States and other stakeholders were encouraged to reflect on new and emerging development challenges and their implications for the two major objectives of the Post-2015 Development Agenda — overcoming poverty and insecurity, and ensuring sustainable development. Toward this end, the Office of the President of the General Assembly was committed to promoting dialogue and increasing engagement on the principles of the Millennium Declaration of 2000, with the purpose of reaffirming and re-energizing our commitments through 2015 and beyond. With a view to promoting a world of increased opportunity for all peoples, a world of equity, freedom, dignity and peace, the Post-2015 Development Agenda represented a significant evolution in the thinking of the international community. This new Agenda underscored the interdependence of all the countries that comprise our planetary community, regardless of development levels. The Office of the President of the General Assembly believed that the time had come for the General Assembly — the supreme, deliberative organ of the United Nations — to exercise its collective responsibility and begin, as a matter of urgency, the process of conceptualizing one shared vision of a sustainable future for all peoples beyond the year 2015. During the 68th Session, many of the outcomes of the Rio+20 Conference came to fruition. The Office of the President of the General Assembly was expected to provide the leadership, guidance, and clarity necessary to promote a meaningful dialogue among Member States — one that led to the articulation of the new Agenda. The Office of the President of the General Assembly assisted and supported Member States on the journey toward a clear set of priorities, fashioned with a sense of direction, purpose and commitment, for further deliberation, as necessary, in the following 69th session of the General Assembly. Contributions of North-South, South-South, triangular cooperation, and ICT for development to the post-2015 development agenda . Water, sanitation and sustainable energy in the post-2015 development agenda . Each debate geared towards further elaboration of the chosen theme, as the Office of the President of the General Assembly sought to provide “results-oriented outcomes” on these issues. In preparation for the negotiation phase of the post-2015 development agenda during the 69th session, the President of the General Assembly is convening a High-Level Stocktaking Event to reflect upon the various post-2015 development-related processes which have occurred during the current session of the General Assembly with a view to providing Member States and other stakeholders with an opportunity to identify possible inputs to the synthesis report of the Secretary-General, to the work of the 69th session of the General Assembly, and to the elaboration of the post-2015 development agenda itself. 14 June 2013: 87th and 88th plenary meetings of the General Assembly - Election of the President of the General Assembly for the 68th session.